1968 was a year of unrest: many nations were at war. People marched for peace, fairness, and freedom. At the same time, the Apollo 8 crew was about to go farther into space than anyone had gone before--to the moon. As they surveyed the moon's surface, astronauts aboard Apollo 8 looked up just when Earth was rising out of the darkness of space. They saw the whole planet--no countries, no borders. The photograph they took, Earthrise, had a profound effect when published widely back on Earth, galvanizing the environmental movement, changing the way people saw our single, fragile home planet, and sparking hope during a year of unrest. 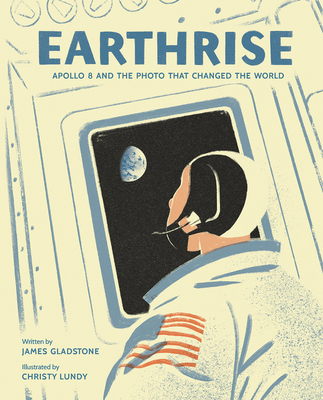 This important and timely picture book is publishing to coincide with the 50th anniversary of the Apollo 8 mission, telling the story behind the photograph, both inside the spaceship and back on Earth. Text includes dialogue pulled from NASA's Apollo 8 transcript, drawing readers into the iconic moment Earth was photographed from space. An author's note at the end explains more about the photograph, the Apollo 8 mission, and how Earthrise went on to inspire Earth Day.